I spent the afternoon in Askeaton yesterday working with David Patton and his Polish-born brother-in-law Beniamin Sobotka, who are working on The Spiritual Journey of Ireland. This is a full-length video documentary that promises to take us around the island of Ireland, exploring our spiritual history and taking in the historic sites that connect us to our spiritual past. He says the topic gripped him then and has stayed with him ever since. 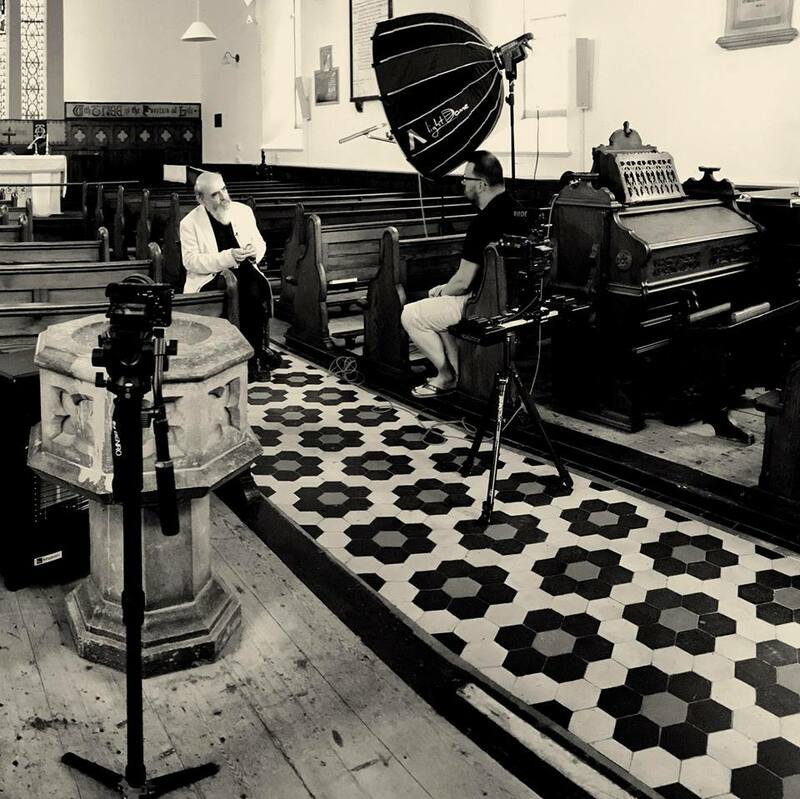 Filming is taking David and Beniamin to heritage sites across Ireland, enjoying the opportunity this bright summer weather provides to capture the beautiful landscape as a visual backdrop to the spoken content delivered by many contributors. Apart from me, the contributors include Nick Park, Executive Director of the Evangelical Alliance Ireland, and Dr John Scally, Professor in Ecclesiastical History at Trinity College Dublin. Earlier in the day, I was a speaker at an event in the Desmond Castle, Newcastle West, marking the restoration of the Baptismal font from the former Saint Thomas’s Church, and its return to Newcastle West. 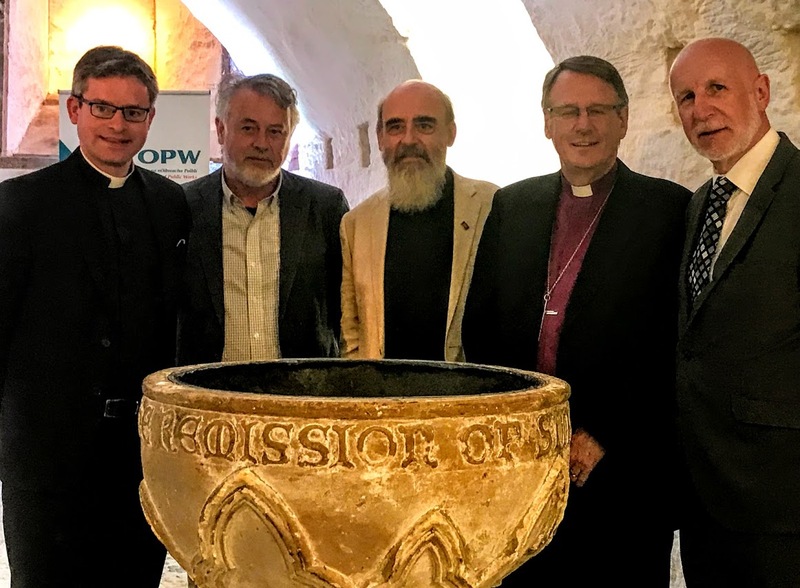 As well as senior representatives of the Office of Public Works, the attendance included the Bishop of Limerick, the Right Revd Kenneth Kearon, and the Dean of Saint Mary’s Cathedral, the Very Revd Niall Sloane. After a busy day yesterday, two of us sat out in the rectory garden until late in the evening [27 June 2018], while the temperature remained in high 20s. We sat there for what seemed like an interminable evening in the sunshine, sipping wine, admiring the roses, reading the papers, enjoying the sunshine, and occasionally getting up only to stroll through the garden gate and into the fields behind the rectory, where the grass has been cut and the hay has been rolled into bales. These are unusual summer days for west Co Limerick. It had been a busy day, speaking at a public event in the Desmond Castle, Newcastle West, and then working throughout the afternoon with a film crew at Saint Mary’s Church, Askeaton. The temperatures rose beyond 30, making these hotter days than those in Crete a week ago. And, as the evening seemed to stretch on endlessly, we sat there, in the warm evening sunshine, basking in the sun-induced laziness, I began humming to myself the Andy Williams version of ‘Days of Wine and Roses,’ a popular song from the 1962 movie of the same name. The film Days of Wine and Roses was directed by Blake Edwards with a screenplay by JP Miller (1919-2001), adapted from his own 1958 Playhouse 90 teleplay of the same name. The movie was produced by Martin Manulis, with music by Henry Mancini, and stars Jack Lemmon, Lee Remick, Charles Bickford and Jack Klugman. But, despite the title, and despite what I once thought the song means, this is no romantic move. Instead, it depicts the downward spiral of two average Americans who succumb to alcoholism and fail to deal with their problems. The best-known recordings of the song are by Billy Eckstine in 1961 and Andy Williams in 1963. But several other recording artists have also recorded it, including Shirley Bassey, Frank Sinatra, Ella Fitzgerald, Perry Como and Tony Bennett, and the song has since become a jazz standard. Yea, all the time, because the dance was long: I have been faithful to thee, Cynara! in my fashion. This earlier poem was first published in The Second Book of the Rhymer’s Club in 1894, and it is also the source of the phrase ‘I have been faithful ... in my fashion. Margaret Mitchell, touched by the ‘far away, faintly sad sound I wanted’ of the third stanza’s first line, chose words from that line as the title of her novel Gone with the Wind. In a useful piece of information as the World Cup moves on to the next stages, the Oxford English Dictionary says Dowson provides the earliest use of the word ‘soccer’ in the written language – although he spells it ‘socca,’ presumably because it did not yet have a standard written form. Both Mancini and Mercer said that once they had the title, the words and music rolled out and could not be written fast enough. Andy Williams sang the song on the film songtrack, winning a gold record, while Mancini and Mercer won a Grammy for Song of the Year and the Academy Award for Best Original Song. Coincidentally, Johnny Mercer, who wrote the lyrics for the title tune, also wrote the lyrics for the theme from Laura, a 1944 film in which Dowson's poem is quoted in its entirety.